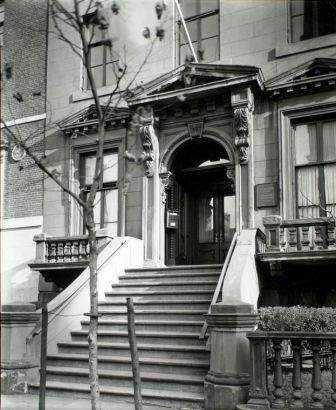 By the time Ira Hawley built his grand brownstone home at 47 Fifth Avenue in 1853, he had acquired a fortune. Born in Ridgefield, Connecticut in 1793, he became a partner as a young man in Holmes, Hawley & Co. When he retired in 1841 he held directorships in several New York financial and commercial institutions, as well as having founded the Pennsylvania Coal Company. 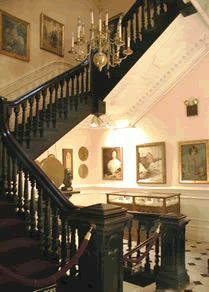 Hawley's house reflected his wealth and social status. The broad brownstone facade, four bays wide, was accessed up a wide sweep of graceful steps above a rusticated basement floor. Classic carved Anglo-Italianate pediments surmounted the first floor windows and ornate doorway. French doors on the parlor floor opened to brownstone balconies. Inside, no expense was spared. 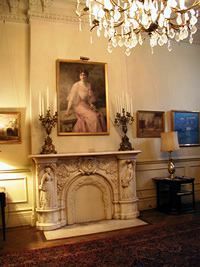 Heavily carved mantles of Italian marble, rosewood doors and elaborate plasterwork on the ceilings testified to Hawley's rightful position among neighbors with names like Brevoort and Lenox. Hawley, who had enlisted in the Eleventh Regiment of Artillary during the War of 1812, was diplomatically described by Emmons Clark in his 1890 History of the Seventh Regiment, "He was not distinguished as a soldier, but was a good executive officer, an accomplished businessman, and a popular and estimable gentlemen." Hawley died in 1865 while traveling in Rome. A few years later, in 1871, a group of artists began assembling on Saturday evenings in the studio of sculptor J. Scott Hartley, the son-in-law of George Inness. Calling themselves "The New York Sketch Club, the artists would discuss each other's works, socialize, and paint or sketch. Little by little other artists would include themselves in the group until by 1880 it was so well established that they incorporated. In reference to the varied background of the group and inspired by Washington Irving's papers in which "salmagundi" referred to a stew of many ingredients, Hartley suggested "The Salmagundi Sketch Club." Nearly from the start the club was an important showcase for American artists. Over the years its membership has included George Inness, Howard Chandler Christy, Robert Frederick Blum, William Merritt Chase, Emil Carlsen, Hugh Bolton Jones, Dean Cornwell, Gari Melchers, John Francis Murphy, Frank H. Desch, Guy Wiggins, Childe Hassam, N.C. Wyeth, Louis Comfort Tiffany and on and on. A few non-visual artists such as John Philip Sousa, Stanford White and Tony Pastor were also members. In its space at 14 West 12th Street, a considerable library was amassed for the members, some of whom were unable to afford to buy books. In 1898, William Henry Shelton wrote to The New York Times "The library of the Salmagundi Club, through the generosity of one of its members, Mr. J. Sanford Saltus (to whom it is indebted for over 200 books) has just been enriched by a gift of over forty-odd volumes and portfolios." Shelton goes on to describe the books, most of which "are valuable art publications, richly embellished and sumptuously bound," several of which dated to the 16th and 17th Centuries. In 1917 the Club purchased the Hawley house at 47 Fifth Avenue. A two-story addition was added to the rear to house a gallery and a billiard room. 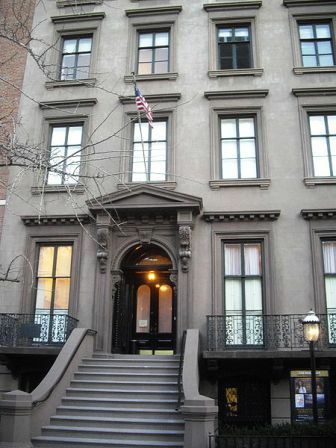 It instantly established itself as the center of art in Greenwich Village, giving exhibitions, art classes, lectures, debates and fund-raising activities. The Club carefully preserved both the exterior and interior of Ira Hawley's lavish home. At one point the brownstone balcony balustrades were replaced with exquisite cast iron and the pediments over the parlor floor windows were removed. Otherwise the house is happily unchanged. On September 9, 1969 the New York Landmarks Preservation Commission designated 47 Fifth Avenue as a landmark. Noting that it is the last remaining house of its kind on lower Fifth Avenue, the Commission pointed out that "it displays many find architectural details, executed in the best tradition of craftsmanship."